Display is 8 digits (1 digit is not working in the machine photographed), amber gas discharge, Burroughs Panaplex II. Integrated circuit - Rockwell A1030PE. 220 mm x 168 mm x 50 mm (8.75" x 6.6" x 2"). 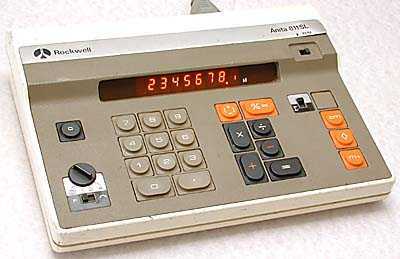 "Made in England, Electronics Group, Rockwell International. Distributed in UK by Sumlock Anita Ltd.". The "SL" in the model name stands for Slim Line. 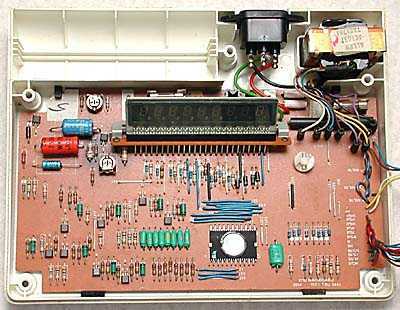 The interior of the 811 SL, showing the Panaplex II discharge display and the Rockwell chip. This machine was designed with room for rechargeable cells, top left, should a version needing them ever be required.